If your business is registered for GST you are required to lodge your Business Activity Statement (BAS) either monthly, quarterly or annually, depending on the registration period. 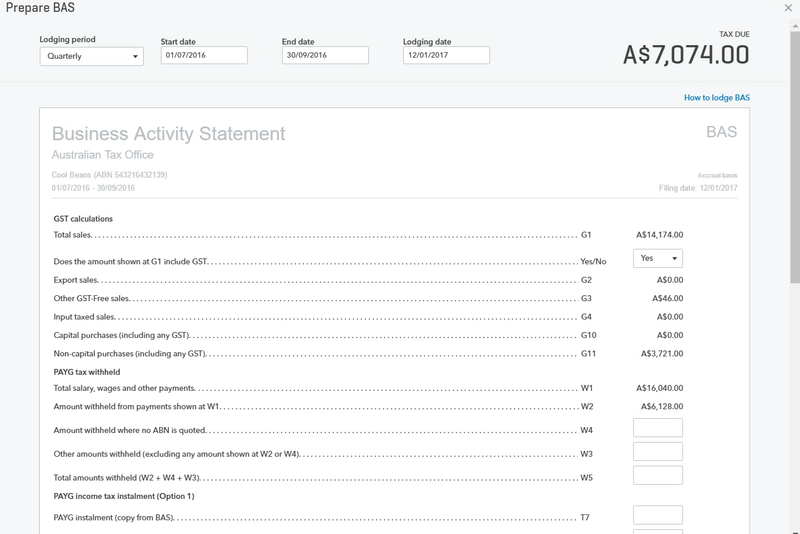 We walk you through the steps of checking reports, right through to lodgement in the new look. For customers that still have the previous version please check out this link for procedures: Lodging BAS Using QuickBooks Online. If the business is registered for GST, you will first need to set this up. 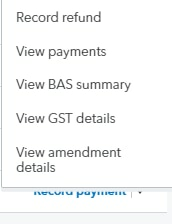 On the left-hand navigation menu select the GST tab; this will take you to the GST Centre. Click on Set up GST. This will start the set up process of GST in your business file. 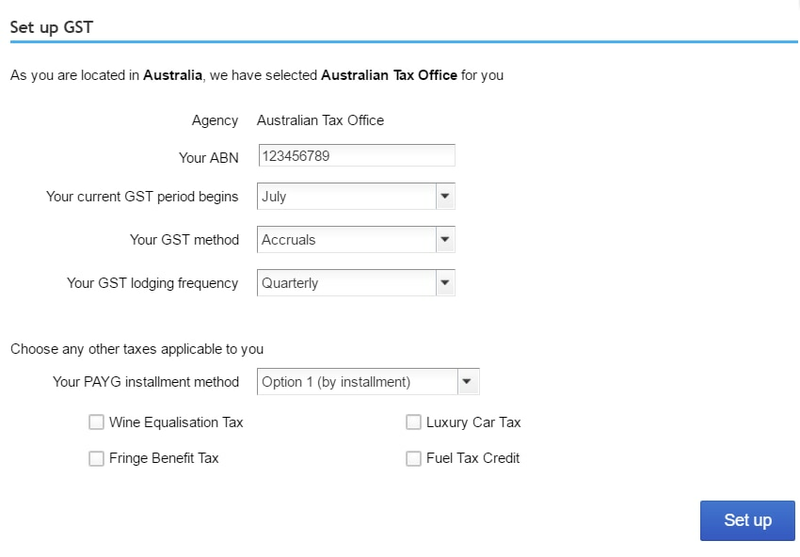 Enter your business information in the window that pops up, such as ABN, Period, GST method, GST lodging frequency. This information will be found on your paper BAS form. If not, please contact your BAS or Tax Agent. The BAS Liabilities Payable account is where the GST Collected and GST Paid amounts are posted when transaction’s includes GST. The BAS Suspense account is like a clearing account; once you lodge your BAS in QuickBooks Online, the amount payable or refundable will be posted to this account. These two accounts can be renamed if you prefer. From your Chart of Accounts > choose account to edit name > under Actions column drop down menu click on Edit and change the name. 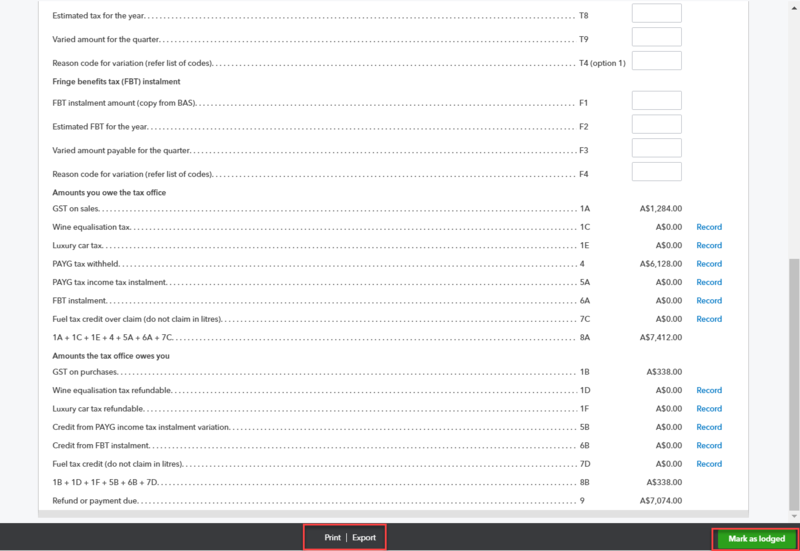 Select the GST tab from the left-hand navigation bar. Assuming you have done your normal bookkeeping tasks, bank account reconciliations, GST reconciliation and completed your BAS Checklist for compliance issues, check our blog BAS Checklist. and any other GST code that is required in the posting of transactions. Ensure when checking reports for GST that the correct dates have been chosen that match the GST period being worked on. 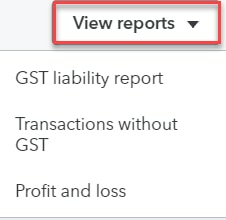 Once all Reports have been viewed and checked and all GST codes are correct and correspond to the correct reports click on Prepare BAS (number 9). The Business Activity Statement will be produced and ready for filing. Bottom of this page you have the option of Print or Export (this will be in an excel format) the BAS lodgement prior to Marking as lodged. It depends entirely on your process as to whether you hit ‘Mark as Lodged’ before or after you physically lodge with the ATO. Either way, you need to hit the Mark as Lodged button, at the bottom of the window. 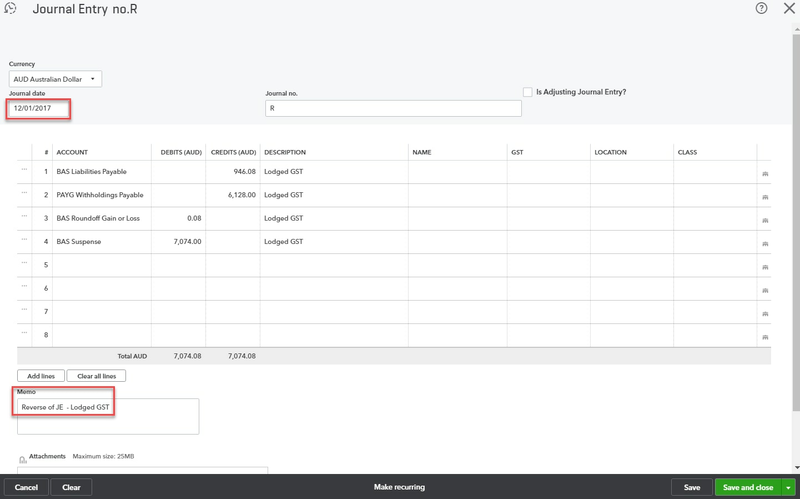 When this process has been completed, QuickBooks Online saves a snapshot of your lodgement and generates a journal to reduce the BAS Liabilities account by what is being paid or refunded, and moves this total amount to the BAS Suspense account. Let’s look at marking as lodged and what happens. Clicking on the Mark as Lodged button will bring up a window to confirm you will be closing the books for the GST period and any transactions changed from this period and previous periods will be shown in the GST amendment report next quarter or cycle of BAS reporting. Your BAS has now been closed and is ready for the next cycle of BAS Lodgement. Check the GST Centre to view your BAS Lodgement. The Record Payment button can be used to record the GST payment, in this example we paid partial payment of $5,000.00 on the 12/01/2017 & click on Save. The partial payment can be seen under the Payments column and the Balance will show the outstanding amount of the BAS for that period. 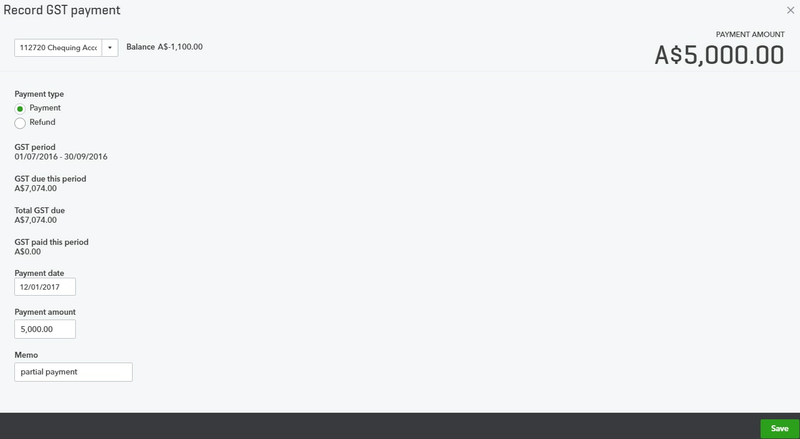 At the Record Payment click on the drop down menu and you can view lodged history reports and information. 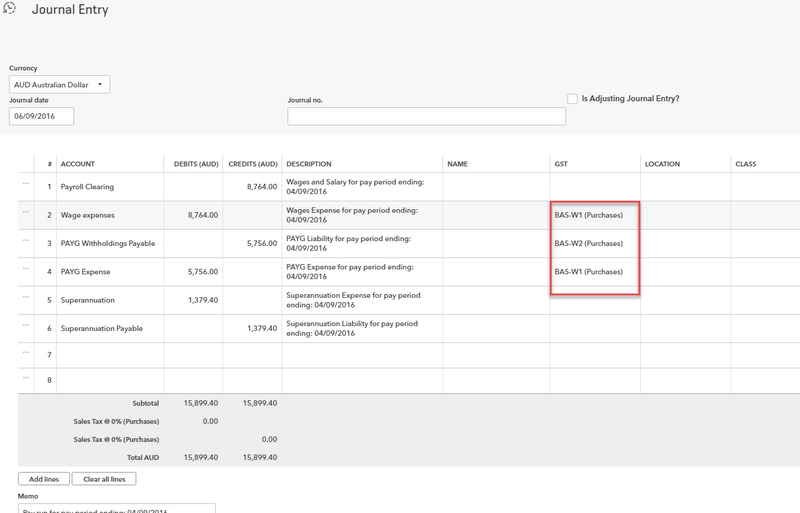 QuickBooks Online will create the journal entry debiting (or crediting if you have a refund) to the BAS Liability account and posting to the BAS Suspense account. If payroll is processed through the payroll centre, the journal will also capture the debit to PAYG Withholdings Payable and credit to the BAS Suspense account. The Journal Entry will be created as at the date you clicked on Mark as Lodged. 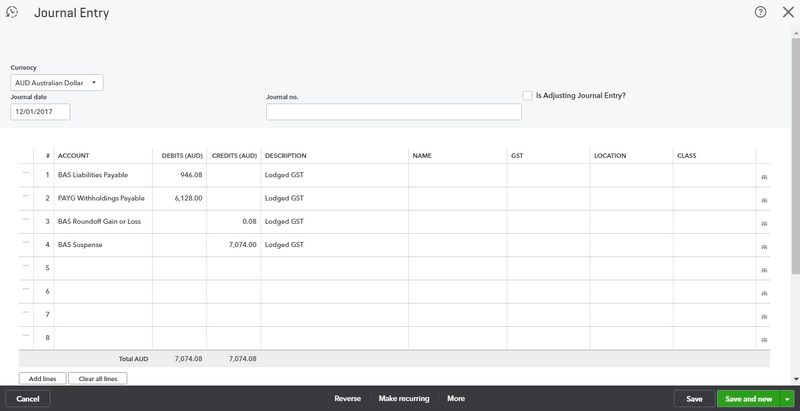 The journal date can be edited if you want to reflect the journal date as at the last day of the quarter or period you are reporting on, so that your General Ledger accounts are as you prefer to see them for reconciliation purposes. ** Please note that you cannot add any description or add new account items to this journal. A work around is to reverse this journal and redo this at the date, description and additional account details as required. When making a payment or receiving a refund for a BAS you have lodged, you have two options. Option 1: Record the payment from the GST Centre by clicking Record Payment from the Lodge BAS section. Make sure you enter the correct date of payment and choose the bank account of payment. I recommend entering a memo as well, for example: “QTR 1 BAS 2017” “Partial Payment” etc. Option 2: When reversing out the system-generated journal, the amount that would go to the BAS Suspense account, post this to an ‘ATO RBA Clearing account’. This can be called many things to many Advisors, but as a general rule this account is what is owing at the ATO Integrated Client Account Running Balance. 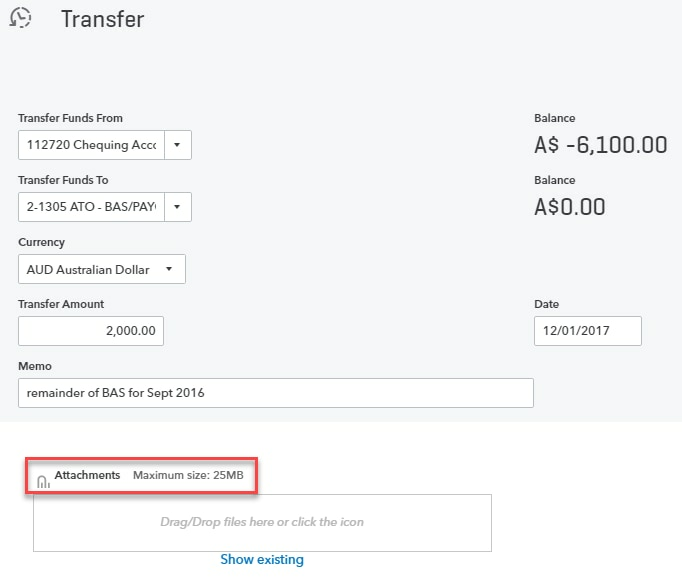 Recording your journal to the ATO RBA Clearing account allows the reconciliation at quarter end to both the Balance Sheet account and ATO account. In some instances, you may have clients that have a payment plan and this works well so strict control in this account takes place. Once the new journal has been entered and the amount has been posted to the ATO RBA Clearing account, all that is required is a Transfer and entering in the Memo of ‘Payment QTR 1 BAS 2017’. **Tip: In this journal under Attachments you can add the scanned paperwork or PDF document of your BAS for the period. Do not post journals directly to the BAS Liability account. You are allowed to, but I would recommend not to. Although it will post to the Balance Sheet account, it won’t show up when you complete your BAS through the GST Centre. You can, however, assign the GST code on the line item when processing through the journal entry and this will work correctly for your BAS Reporting and Lodgement. There are two options when it comes to reporting Monthly IAS and Quarterly BAS in QuickBooks Online. If using KeyPay in QuickBooks Online, you will need to edit the journal entry that QuickBooks Online creates by deleting the tax codes. These tax codes are automatically created when payroll is turned on and it is these tax codes that populate the amounts on the BAS Worksheet in the GST Centre (Complete BAS tab). 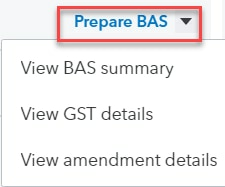 So by choosing the journals for the two months that have already been processed for IAS, and changing the BAS-W1 and BAS – W2 (Purchases) under GST codes to Out of Scope (Purchases), this will remove these two months’ amounts from the BAS Report, and will not show up on your BAS reporting for the period omitted. You will need to do this for the first two months of the quarter ONLY and then leave the journals for the third month, as you want this to appear on the Quarterly Prepare BAS Worksheet. For the payments for the first two quarters, you can create an Expense for payment and take it directly out of the account PAYG payable on the date of payment. Or, if the end of month dates are important to reconciling the PAYG Withholding account, journal the PAYG amount to your BAS Suspense account or ATO RBA Clearing account so you have a running balance of the GST and PAYG which will match your integrated client account. If you are not using QuickBooks Online payroll, or you may be using a dedicated payroll company, then you would process your wages and PAYG as normal via a journal entry to bring the amounts into the financials. If IAS is required on the last month of the BAS cycle, when processing the journal to your Wages and PAYG add W1 and W2 so this will be reflected on your BAS Worksheet. This will add it to your BAS for the quarter cycle for the month. If only reporting PAYG Quarterly, you will need to add the W1 and W2 to all the journals for the quarter so that the quarter totals are reflected in the BAS Report. **Tip: Set up a recurring template in Recurring transactions so this journal is already set up to remind you of the GST codes. The amounts of PAYG will be picked up via the journal when processing the BAS as mentioned by clicking Mark as Lodged. This will generate the system journal and then you decide which procedure you would like to follow. Lodgement of your BAS for your business can be complex. We highly recommend that if you don’t understand any of the components, engage the services of a BAS or Tax Agent to assist you.